Hi! Will definitely make this tonight! Brings back memories. I just wanted to know how much was in the achote powder packet? Is it 1/3 oz? Each packet contains 1/3 ounce of powdered achote, which is roughly 2 teaspoons. I hope you give my recipe a try. Let me know how it turns out. As for the bacon, you could cook actual bacon along with the onions (use the resulting bacon fat as well), then continue with the rest of the recipe. Thanks so much for posting this recipe. I was a Navy brat in the ’70s and some of my fondest memories of Guam include the absolutely delicious food! School (Pedro C. Lujan Elementary) meals were a slice of paradise to me. They had egg fried rice for breakfast (super yummy) and the red rice at lunchtime was definitely near the top of my list of favorites. And, you could eat as much as you wanted! By the time my dad was halfway through his tour, I had to start playing little league football to lose some weight. Shout out to Mrs. Layo and Mr. and Mrs. Hoover! Now that I’ve related my life story, one question: The red rice we had at school seemed much darker in color. That’s probably from using more Achiote, right? Hafa Adai! I’m glad you still have fond memories of your time living on Guam. As for the color of the rice, yes and no—you could make the color darker by adding more achote powder, but keep in mind that older packets of the powdered form get lighter the older it is. Always look for the packages that are darkest in color. Now, on Guam, we most often use the fresh achote seeds that are scrubbed in water to extract the red color. Using fresh always gives you the best flavor and darkest color. You can buy dried seeds at some Asian or Hispanic stores, but like the powdered version, the older the seeds, the less likely you are to get a really dark color from it. 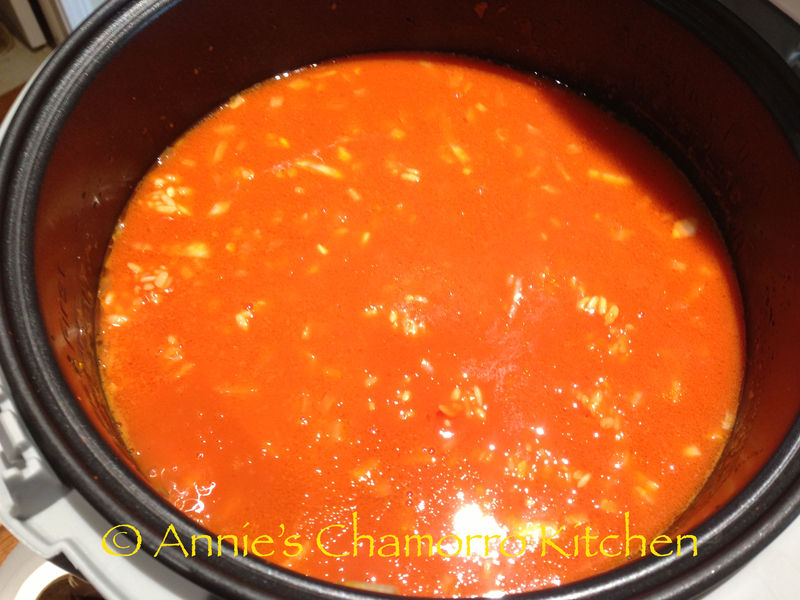 Annie, what if I needed to cook 5 cups of red rice…what would your recipe look like for 5 cups? Hi Vanessa! 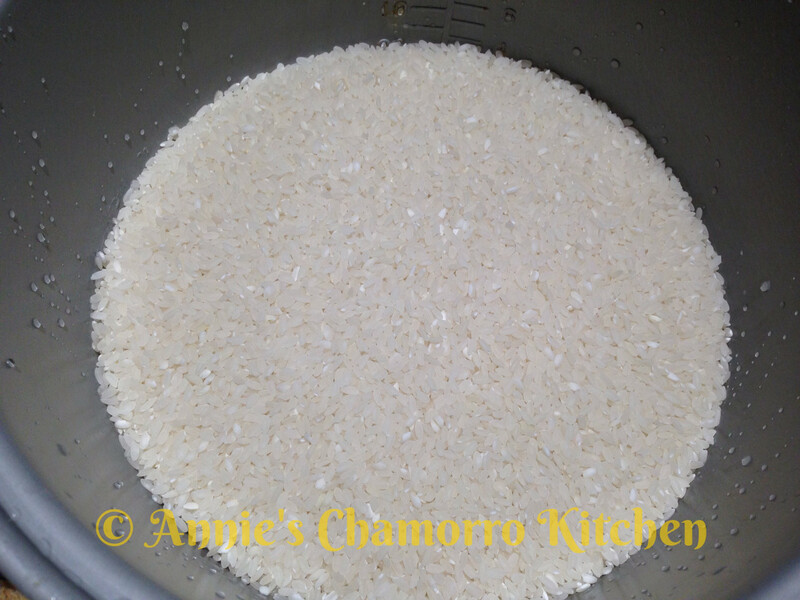 My post includes a recipe made with 10 cups of rice, so all you’ll need to do is cut those measurements in half to make 5 cups of red rice. Ai, why didn’t I think of that!? So if cook on stovetop do I still boil water first and then pour it into the pot with rice? You don’t have to boil the water first. 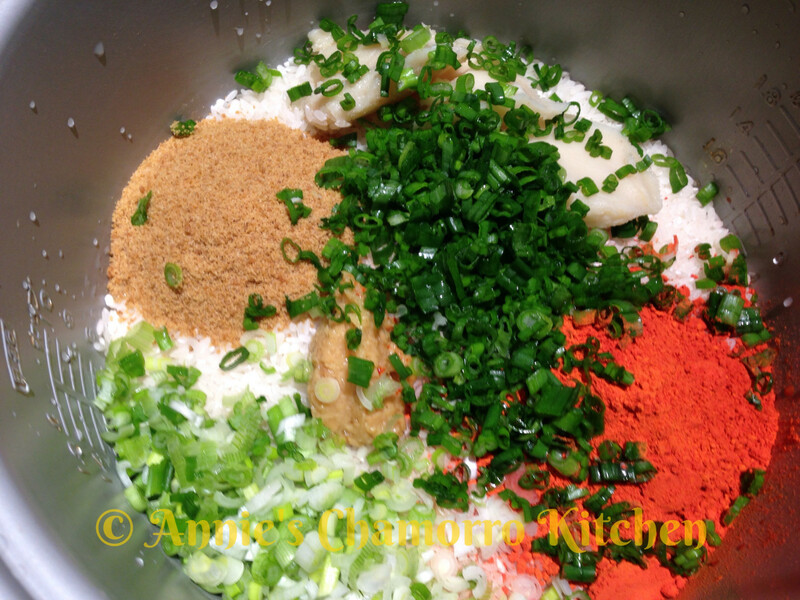 You can mix all of the ingredients together and add it to the pot at the same time. No rice cooker. How do I cook this on stove? Place the pot over medium high heat. Cook until it comes to a boil (stir at least once) then reduce the heat to low until all the liquid has dried up. Turn the heat off and let the steam finish cooking the rice. When I bring it to boil is the rice covered or once it boils put a cover and put it on low heat? Keep the rice covered the entire time. When it comes to a boil, reduce your heat to low. When all of the liquid has absorbed into the rice, turn the heat off, and keep the lid on. The rice will finish cooking for several more minutes after the liquid is all gone and the heat is off. Don’t forget to stir it at least once while it is boiling. Sorry I’m not an avid cook- what do you mean “scrub seeds”? The achote seeds are naturally coated in a red substance that’s used to color and flavor the rice. To get the coloring off, place the seeds in water and used your fingers to rub them together to get the color off the seeds. You’ll use the colored achote water for your rice. Can you clarify how many teaspoons are in a packet of achote? Hafa Adai! One packet of achote powder is approximately 2 teaspoons. What kind of Dashida…what flavor? I just moved away from my island a couple weeks ago, and making red rice with fina’denne for dinner felt great! The time zone difference to Guam makes it hard to call people back home for the correct recipe, so I was thrilled to find it posted here. Do you have experience with mailing the achote seeds from guam? Is the flavor difference worth sending for the real stuff? Hafa Adai! I’m glad you were able to feel like you were back home eating the food you love. If you can get achote seeds from home, I’d use that over the powdered achote any day! The flavor is so much better using fresh achote seeds. I’m so happy to have come across your website. I’ve been missing home and your recipes and instructions are so easy to follow and the outcome is delicious every time! Thank you! Hafa Adai, Shirley! Thanks for stopping by. Stop by again soon and let me know how your family likes my recipes. Happy New Year! I tried the Spam kelaguen to the letter and it was a grand-slam hit among friends and my family! 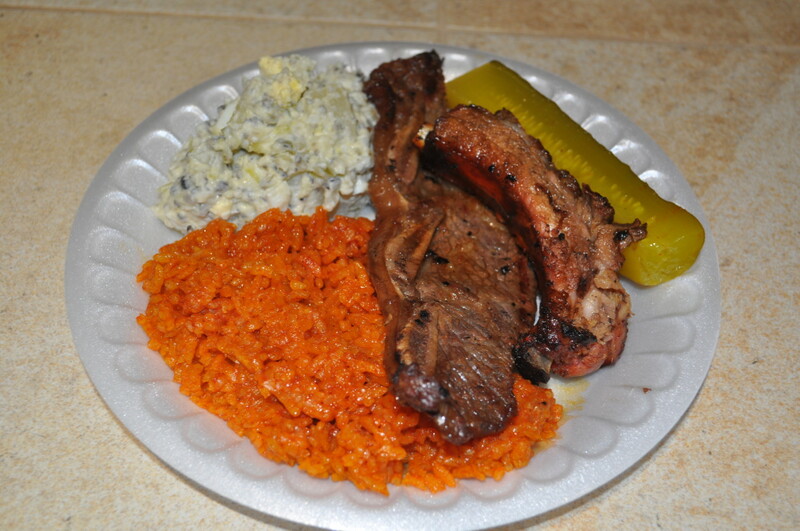 Si Yu’us Ma’ase, Ms. Annie, for creating this beautiful Soulful-Chamorro food-blog. 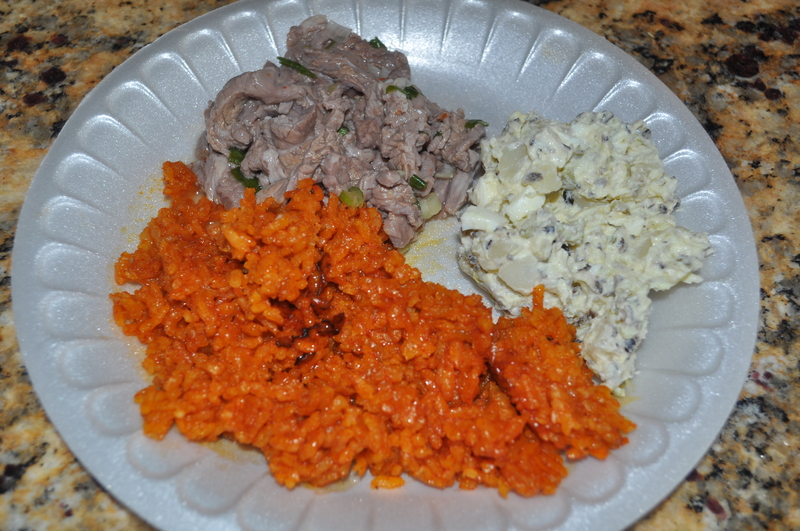 I am revisiting my Chamorro roots with my palate again sa esta ‘gof mahalang adai yo’ of our food items back home. Next on my list is the Red rice. Need to ask you about the empanada tools you used in making what looks like will be another future staple menu added to our house-hold especially when we are going to endure this cold freezing climate out here in the Northwest! So, question for the empanada recipe. What other alternative can we do to limit the use of cooking oil? Can this still be done while maintaining it’s original flavor and texture? Spam kelaguen is definitely a staple in my book. As for an alternative to frying empanadas, there really isn’t one that will crisp up the crust the way frying will. One thing you could do is make an “empanada Dip” — make the filling and place in a serving bowl, then make the dough for the crust, only roll them thin and cut into small pieces. Deep fry the dough only to make chips for your filling “dip.” This way, you don’t have to worry about any empanadas (and filling if the crust opens up) soaking up too much oil. I will try this then! Thank you so much for your insightful suggestions – when I am trying recipes I have to consider the friends health issues and my heart swells when they enjoy the meals I prepare I will let you know this suggestion turns out. Is there a way I can find out how to make this with 2 cups of rice? Also, do I use the whole packet of achote powder? I’m using mama sita achote powder. Do I need to use Dashida seasoning? Thank you for posting this awesome recipe! I just need to bbq and kelaguen and it’s all good! 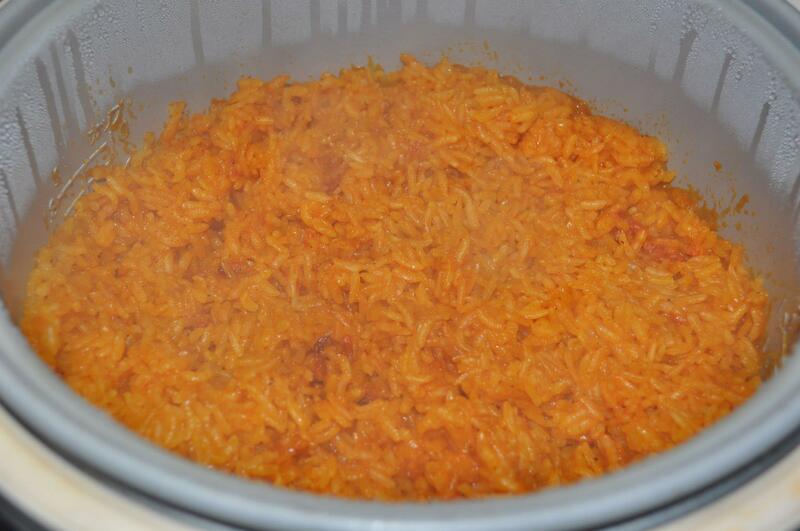 For 2 cups of rice, you can use the entire packet of achote powder (your rice will be a very dark orange). Add 2 1/4 cup of water. Decrease everything else by 1/3 of the amount given. You can use salt instead of Dashida. Just use half of the amount called for since Dashida is not as salty. Wow! You reply quick! Thank you so much for the assistance. I appreciate it! You’re welcome! Let me know how your rice turns out. I tried out your recipe and it tastes just how I remember it from my childhood! I even wrote about it on my own blog and gave you a shoutout! Thank you so much! Hey, Anthony! Thanks for giving my recipe a try, and I’m glad this was what you remembered! And thanks for the shout out on your blog!! Do you close the lid when you cook it on the cooker? or you leave it open? Yes, keep the rice cooker lid on/closed the entire time. Should I measure the rice with the rice cooker cup or a regular kitchen measuring cup? I usually use the rice cooker cup. Do you use the rice cooker cup for the water measurement as well? What do you mean when you say scrub the achote seeds? You have to rub the seeds together in order to get the coloring off. Never heard of Dashida? What is that ingredient and where can I find it? Thank you! It’s a beef seasoning, kind of like bouillon. You will find it in Korean markets. Where would you buy this dashida seasoning? You can find it at Korean stores, or at any Asian store. Thank you for this recipe . Is the dashida beef stock seasoning ? Yes, it is. You can use beef bouillon if you can’t find any Dashida. Hi Virginia! Thanks for stopping by and for sending my recipe to your girls. Where in Colorado do they live? I’m in Colorado Springs. I think this is awesome! I have finally mastered making red rice. Im from southern cali but my fiancé is from GUam. His mom has taught me a lot and I love the food!!!! where did the green onions go? Can you leave out the green onions then? i thought you had to use a gummy rice to make red rice? You can use short, medium or long grain rice, even brown rice. Could you please tell me where I could possibly find the dashida? As far as the achota powder, it’s the Goya brand which I think is a little sweet, but that should be ok to use? Appreciate you publishing these recipes for us!! Hafa Adai, Ricky! You can find Dashida at any Korean store. As for achote powder, I usually use Mama Sita brand, but Goya will work if that’s all you can find. If I’m also using the Goya brand should I still use 3 packets? In my experience with the Goya coloring, you need to use twice as much to give your rice that signature deep orange color. If you don’t mind that Goya brand seasoning also has additional flavors, by all means use it. 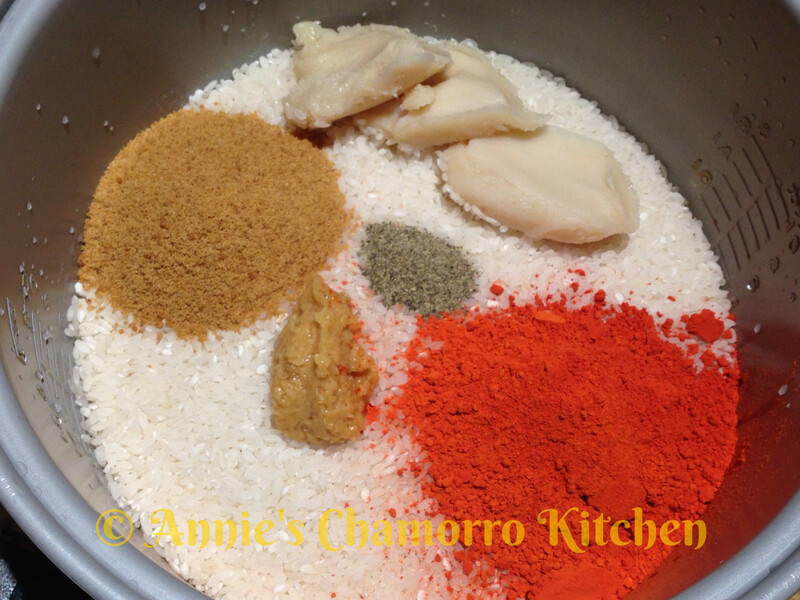 You can email your photos to annie@annieschamorrokitchen.com and I’ll post them here for you. Hi Shirley! Is there an Asian market where you live, or a Hispanic market? You can find the powdered achote at Asian markets, and achote paste at Hispanic ones. 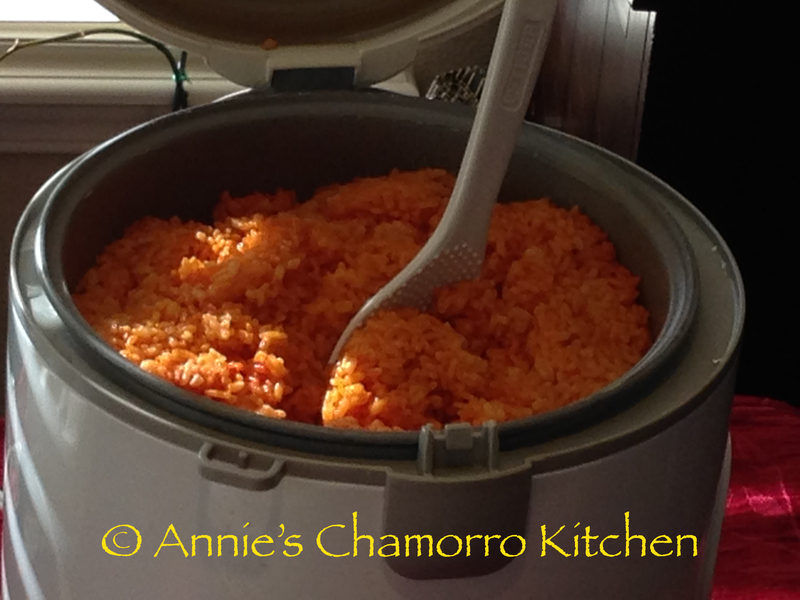 How do you make red rice if you don’t have a rice cooker? I need to make a large batch for 15+ people. Can it be made in a crock pot or in the oven? Please help. Also I can’t get dashida seasoning where I live, will it taste okay without it? Thanks! Cecelia, make the rice in a large pot and cook it on the stovetop. If you don’t have Dashida, you can use beef bouillon or plain salt (use less salt, then taste the liquid to see if it’s enough salt). To cook the rice on the stove, cook over medium high heat (with the pot covered) just until the liquid comes to a boil. As soon as the liquid boils, stir the rice once then turn the heat down to low (the lowest setting on your stove) and cook until the liquid dries up. Turn the stove off, and (leaving the pot covered) let the rice sit for about 5 minutes before serving. This is one of the few dishes my mom did teach me and in her version, she dices yellow onion and bacon (at least 6 slices) and precooks them, then adds it to the rice before cooking. Yvonne, that’s the way I do too! I have to sauté the garlic, onion, then the chopped bacon, then add them to the rice before cooking. It emits a flavorful aroma! Well, quite honestly I think your recipe is good and especially your method of putting all ingredients on top of the rice grains before cooking already looks attractive even before cooking; however, because the annato seeds is what gives the red rice its distinctive flavor, I think minus the dashida seasoning and bacon fat truly preserves what the annato seeds is meant to do, and that’s to give the red rice its distinct flavor simply because the seeds are not only used for coloring but for that true chamorro red rice taste! That flavor always makes me feel like I’m back in the warm climate in Guam and wonderful memories of many fiestas as a child growing up! Cheers!